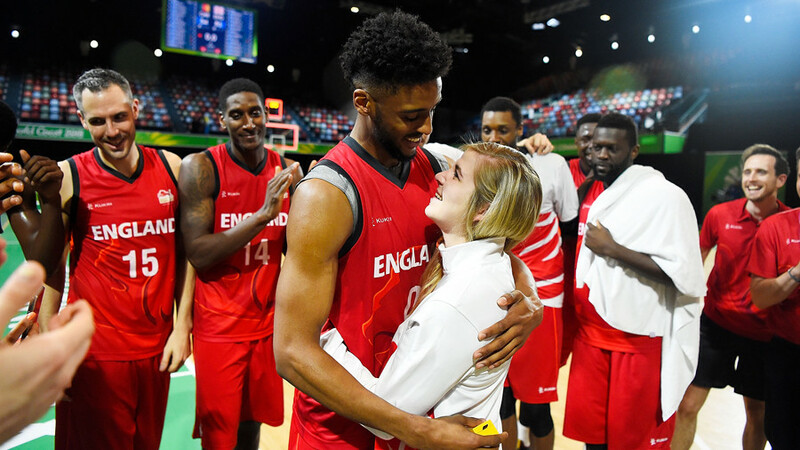 England basketball player Jamell Anderson surprised his girlfriend by making a on-court marriage proposal at the 2018 Commonwealth Games in Australia. On Sunday, Anderson got engaged to Georgia Jones, a member of the England women’s basketball squad, following an impressive 81-54 victory by the men’s team over Cameroon. Having progressed to Round 2 of the competition in Townsville, the players gathered in a post-game huddle to celebrate their win. Jones, who had earlier helped her female teammates to a 78-51 win over Mozambique, was standing nearby waiting for her boyfriend. — Basketball England (@bballengland) 8 апреля 2018 г. As the huddle broke, it revealed Anderson, 27, down on one knee and holding a small box with a ring inside. "I only told them just now," Anderson said, explaining how his teammates helped to arrange the proposal. "They initiated the plan really well, so that went perfectly. It's been on my mind for a while, so now I can just play basketball." "I had absolutely no idea," Jones said. "He told me I was just getting a picture taken. I'm just in shock." — Team England (@TeamEngland) 8 апреля 2018 г.
Anderson, who had earlier received the blessing of Jones' father Jeff, said that the Commonwealth Games was a perfect event at which to make the proposal, as both athletes managed to book spots on their respective teams to represent England at the Games. "We both worked so hard for this opportunity to be here," Anderson said. "Basketball is a very big part of our relationship, so it just made sense to do it here."